For a city-state whose population is set to touch the 1.5 crore mark in the next few years, Delhi is woefully short of trained medical practitioners and has fewer hospitals. Incidentally, the World Health Organisation (WHO) stipulates five beds per one thousand persons. To tide over the impending crisis, the Government of NCT of Delhi plans to collaborate with non-government organisations (NGOs) for setting up homoeopathic dispensaries and also approach the Union Public Service Commission (UPSC) to add doctors qualifying the examination to its pool of personnel engaged in health services. To reach medicare to the deprived sections of society, the Government of NCT of Delhi will be collaborating with non-government organisations (NGOs) in setting up homoeopathic dispensaries in the Capital. Health Minister A.K. Walia informed the House 81 NGOs had applied under the Bhagidari (citizen-government partnership) Programme for financial aid. The Department of Health, he told the members, had earmarked the budgetary provisions to fund 10 NGOs after shortlisting from among the applicants. NGOs registered as a society and having at least three years’ experience and land for setting up dispensary are eligible. “The government will fund the project for the first five years after which the NGOs would be expected to generate enough resources to run their dispensaries on their own,” the minister said. The funding in the first year would be Rs 1.5 lakh from the government coffers. This contribution would reduce to Rs 20,000 by the end of five years. Ten teams in the men’s section and nine in the women’s section will participate in the National Federation Cup Judo Championship for seniors, to be held in the memory of the late educationist J. D. Tytler, at the Talkatora Indoor Stadium in the Capital on July 17 and 18. The championship will be organised by the Delhi Judo Council under the auspices of the Judo Federation of India. Mr Jagdish Tytler, president of the Judo Federation of India, said defending champions Haryana, runners-up Central Industrial Security Force (CISF) and third-placed Central Reserve Police Force would be among the ten teams competing in the men’s section. Other teams in the men’s fray are: Indo-Tibetan Border Police, Madhya Pradesh, Punjab, Border Security Force, Rajasthan, Uttar Pradesh and hosts Delhi. In the women’s section, the participants include last year’s winners Punjab, runners-up CRPF, third-place winners CISF, Uttar Pradesh, Maharashtra B, Madhya Pradesh, Himachal Pradesh, Haryana and Delhi. In the men’s section, bouts will be held in the 60kg, 66kg, 73kg, 81kg, 90kg, 96kg and open category. In the women’s section, bouts will be held in 48kg, 52kg, 57kg, 63kg and the open weight category. Mr Tytler said the Federation Cup is a tournament to decide the team championship of India. He said the Federation Cup is a team event, and no individual performance would be counted. All awards would be for the collective performance of the team alone. A judoka can compete only in one weight group. Bouts will be held on Wednesday from 4 pm and on Thursday from 9 am. Nurul-Islam Gani of Bangladesh stole the show with a consistent display over four days to emerge triumphant in the Qualifying School event for the 2002-03 season’s Golf Tour. Gani’s winning tally of five-over 289 earned him Rs 12,000. The Qualifying School was held at the par-71 Rambagh Golf Club in Jaipur. The earlier two editions were held in Pune. The top 34 players in the final Qualifying School earned exemptions to play 18-hole tournaments on the Indian Golf Tour. Delhi Balbir Singh Verma finished second at 290 while Bangalore’s S. Madhaiah and Chennai’s S. Murthy finished third at 291. Verma took home Rs 9,000, Madhaiah and Murthi pocketed Rs 7,500 each. As many as 329 entries were received of which 65 got direct exemption into the final stages. The tournament was played in two stages with the pre-qualifying school played in two stages and final stage proving to be the deciding one. Each of the pre-qualifying stage was played over 36 holes. The field for the first part of the final stage was then whittled down to 150. Another two-day, 36-hole competition later, the field was further chopped down to the top 100 plus ties, for the deciding part of the final stage, another 36-hole competition. Jyoti Randhawa to join Royal Springs Open. Jyoti Randhawa’s return to competitive golf will be the main focus when the Royal Springs Open commences at the Royal Springs Golf Course in Srinagar on Thursday. Jyoti was involved in a motorcycle accident in March this year, and missed over five months of competitive golf. The Royal Springs Open is the lung-opening event of the Indian Golf Tour. A major, the tournament offers a total purse of Rs 15 lakh. “I am looking forward to the Royal Springs Open”, said Randhawa. “I am 90 per cent fit at the moment and getting better every day. This should give me a good idea as to what I need to do to get back to prime form”, he added. The Royal Springs Open is the second Tour event to be staged at the Royal Springs Golf Course. 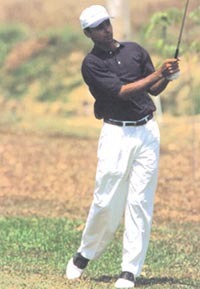 The earlier event, the Sher-e-Kashmir Open, was held in Srinagar in October 2001, which was won by Mukesh Kumar. Randhawa had finished tied third with Jaiveer Virk of Delhi. “The golf course is in superb shape. It is a lot greener than it was when we last played here in October last year. Also there is a constant cloud cover and there is a lot of humidity in the air”, observed Randhawa. “I know Mukesh in good form and I feel there is a tough fight on the cards this week”, he added. Randhawa’s biggest challenge comes from Mukesh Kumar. He takes this game more seriously. Karan Rai hit a fine, strokeful 104, studded with 12 boundaries, to help Modern School, Barakhamba Road, defeat Salwan Public School by 101 runs in a league match of the second Raman Lamba Memorial Under-15 Cricket Tournament at the Salwan Boys ground. Batting first, Modern School amassed 184 for two wickets in 35 overs, thanks to the brilliant unbeaten century of Karan. In reply, Salwan Public School were dismissed for a measly 83 in 29.4 overs. Scores: Modern School: 184 for 2 in 35 overs (Karan Rai 104 n o, Jagrit Anand 32, A Kapoor 22). Salwan Public School: 83 all out in 29.4 overs (Karan Rai 4 for 17, Mohit Malhotra 2 for 16.